Whether your style is country or coastal, this fabulous indoor-outdoor stacking side chair is a colorful solution to extra guest seating. 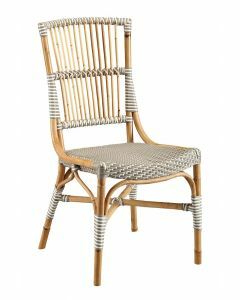 Inspired by classic European bistro chairs, the pretty and practical chair is crafted of teal and white wicker and aluminum faux bamboo for easy care. This chair measures 18"W x 21.6"D x 34.6”H; the seat measures 17.3"W x 17.3"D x 17.30”H. Click on images for greater detail.